Something a bit different to the normal Flickr - Sunday Best postings of late. 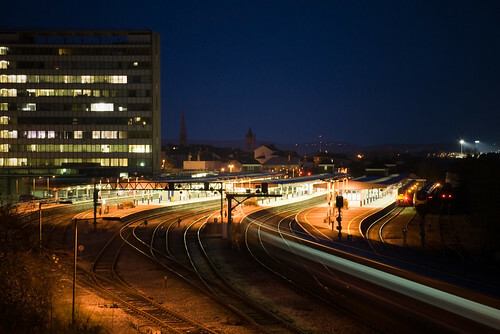 This lovely evening shot of Plymouth Railway Station by mile-age. I walk over this bridge every night from Uni, or going to/from my Girlfriend's place. It's absolutely stunning at night. In fact, I've only just walked across that bridge now (at about 3am), the sky's completely clear, and seeing that scene on a starry backdrop is just amazing. And people complain about the railway station (or anything else in Plymouth for that matter). They just need to step back and see things from a different angle (literally in this case).